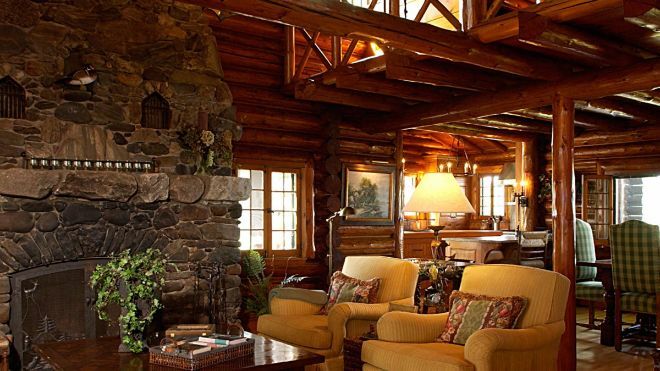 In the world of log homes and cabin retreats, there is nothing quite like the look of a well-aged rustic getaway. When the natural materials used to construct a log cabin have the opportunity to settle into their natural surroundings, it produces the eye-catching details which perfectly complements the back-to-basics lifestyle. 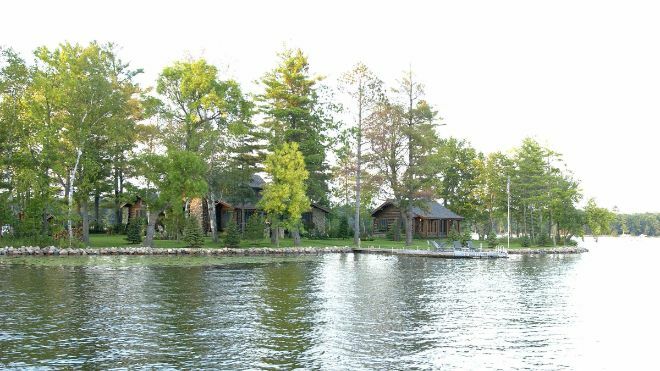 Bay Lake Lodge is located on a gorgeous private peninsula in Bay Lake, Minnesota. It was originally constructed in the 1930s and was lovingly restored by A & H Architecture to preserve the rustic charm yet modernize the layout to improve general living conditions, the natural light, and to maximize the stunning lake views. 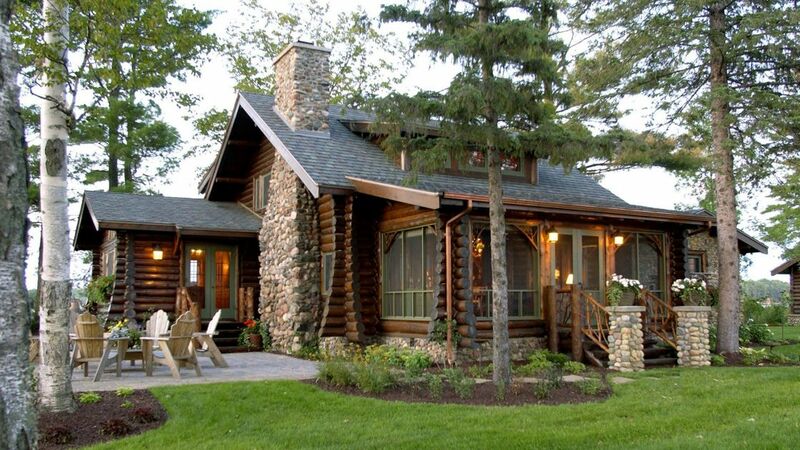 Shall we take the tour and check out this rustic-chic log home? 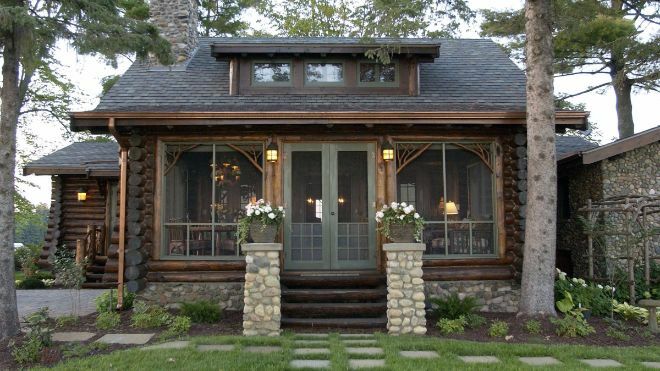 This attractive home has a lot of rustic detailing on the outside, constructed with a great balance of wood and stone. Several new windows and a large dormer were added to the building to improve the overall natural light. The new windows were made by a custom millwork company to replicate the original 1930s windows. 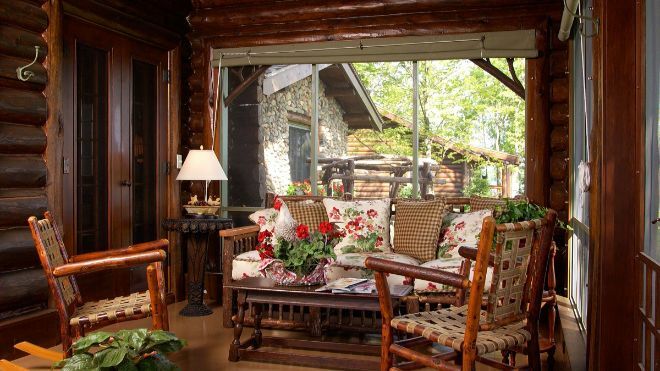 Bay Lake Lodge has an inviting front porch which is covered and screened for comfort. The deep deck area allows for plenty of casual furniture. The great room manages to remain cozy despite the high ceiling. The use of high-quality materials serves to earth the building, giving it a warm and inviting feel. The high ceiling ensures the home benefits from plenty of circulating fresh air. The commanding fireplace reaches all the way to the ceiling, creating a rustic anchor to the main living area of the house. 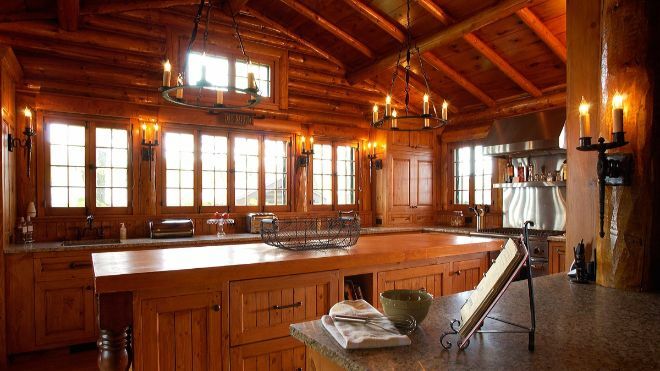 The kitchen in Bay Lake Lodge was completely new at the point of renovation. It was inserted into an existing space which formerly housed two tiny bedrooms and a bathroom. It is a spacious and attractive country-style kitchen, finished with high-end stainless steel appliances. The quaint porch is perfect for those who enjoy the peace and quiet. What a relaxing place to see the day change to night - perfect! Bay Lake Lodge has high-quality finishes throughout. In the picture above, we can see the outstanding levels of rustic design, with a beautifully antiquated sink. 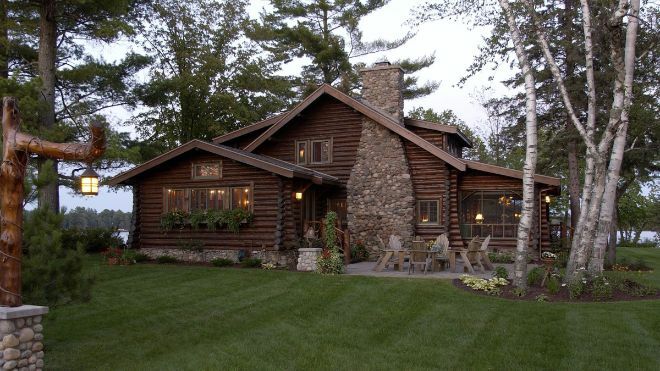 To really capture the best of the log home lifestyle, you need to be surrounded by nature. Bay Lake Lodge boasts a stunning location directly on a lake. 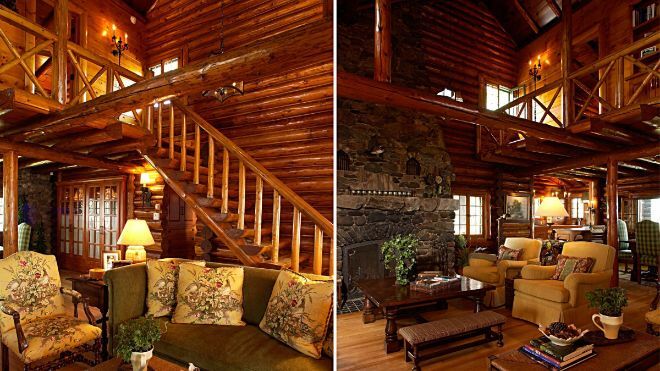 Is this the kind of rustic retreat you dream of? SHARE this tour with your friends on Facebook and spread the log home love! 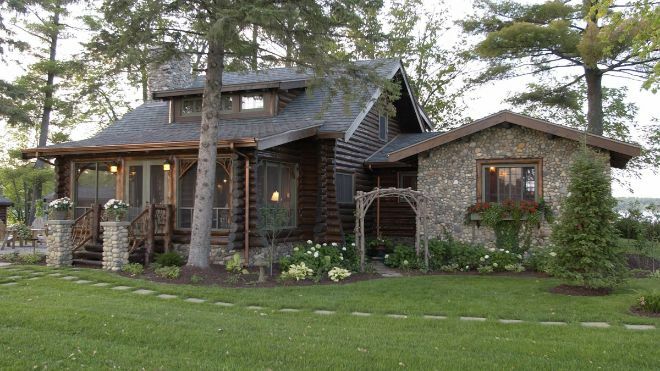 Coventry Log Homes have done it again with a stupefying 3-bedroom home. 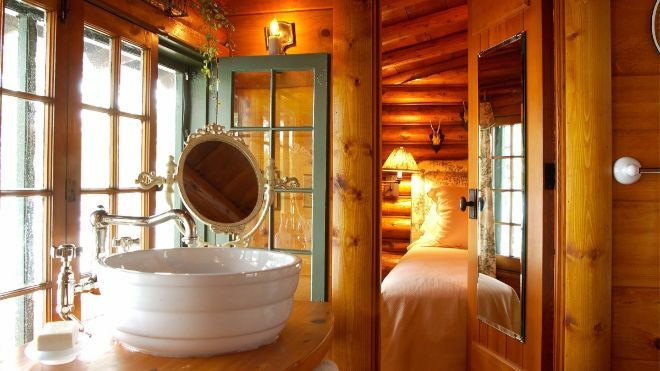 This cabin has three bedrooms and two bathrooms over 1,680 square feet. A home for any weather.